I played two small games agaist my friends fyreslayers using the new rules, and hearthguard berserkers are scary! And the army as a whole has become a lot better. His list wasn't at all optimal but neither where mind. he had 10 vulkite berserkers 5 hearthguard with the axe 5 auric shootydudes And a whole assortement of heroes including a magmadroth with a keyguy on it. My first list was throggoths and I won on objectives because my friend wanted to just test the damage his guys could deal and had we not played knife to the hearth that ended by turn 3 he would've tabled me hard. my second list was a shooty/magicy stormcast list that really highlighted the weaknesses of the fyreslayers, yes the hearthguards could easily dispatch two groups of 5 sequitors worth double their points, but every turn he lost more heroes to my magic, longbow guys and ballista and by the time he was close enough to engage his heroes where dead. I'm with you. 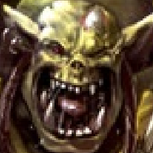 Yet the community survey has me scared a little because instead of Ironjawz, bonesplitters and greenskins being seperate choices they were all listed under Orruks. 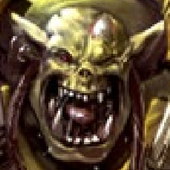 I'd prefer to keep the ironjawz a seperate low model count faction like they are now instead of them becoming like most other factions where you rely on large blobs and some heroes to buff them. Ironjawz could have a rule where instead of counting the models in range of an objective you count the total amount of wounds of all non-hero models. Also recently re-based by Mawkrusha, time to get another one. If you have the Tyrants of Blood battalion and use the Reapers of vengeance slaughterhost and have three command points it would be possible to charge and attack twice with three bloodthirsters before the enemy can do anything. Take one Bloodthirster of insensate rage and give it Ar’gath, the King of Blades to give it 2+ 2+ versus heroes, this to greatly increase the chance of exploding nearby units What I did notice though is that the battalion uses the BLOODTHIRSTERS keyword while the bloodthirsters and skarrband themselves have BLOODTHIRSTER in their warscroll missing the S, technically RAW there are no units in the game that can go in that battalion. Very true, and if pure demons can't have a priest I'll have to convert a few. I hope they'll add the priest rules to one of the demon heroes otherwise going by the description going on the community page this release is going to be pretty lame for demon focused armies. I just had the greatest idea, what we need is a unit of baby mawkrushas led by a Ironjawz boss type guy, small compared to the grown guy but still large enough to gobble up a handful of humanoid sized meals. They should be bulky yet somewhat cute while being absolutely terrifying at the same time as well. So according to this you're saying it's alright to first roll for your move distance and depending on the result decide if you're going to run or not. Some units instead of having a set movement distance can instead move an amount decided by a dice roll every turn. For example Chaos Spawn and Boingrot Bounderz each have a 2D6 movement profile. When you choose a unit to make a move you can at that time declare it will also run in addition to it's normal move. This creates two possible scenarios for units with variable movement profiles: 1: Choose a unit of Chaos Spawn. 2: Declare it will run 3: Roll 3D6 to determine it's maximum movement distance. 4: Move the unit or 1: Roll 2D6 to see the movement characteristic of each Chaos Spawn unit 2: Choose a unit of Chaos Spawn 3: Declare it will run 4: Roll 1D6 and add it to the predetermined movement value 5: Move the unit So far we've been playing it as described in the first scenario however we're wondering if we've been doing it wrong? But she can only cast one spell and the cauldron doesn’t give her an extra one even when cast successfully unlike the balewind vortex. I've fought my friend's BoC a few times with my stormcast, and they're relatively easy to control. They're almost always going to keep a weak unit and a hero near their herd-stone to sacrifice them for more summoning points, it's basically another objective they need to defend because if you take out the unit and shaman it's pretty crippling for them. Only played once vs gitz and it was a fairly even game, but I was using a weaker list because the strong list isn't fun to play with as I haven't lost a single match with it yet, most often I end up tabling my opponents by turn 3 or 4. Okay I was wondering something about the Lord of Change's rule Mastery of magic and how it works in relation to Destiny Dice What happens to the casting value of a lord of change's spell when a destiny dice is used? If I use a single 6 before rolling to cast a spell, will the casting value of the spell become 12? Hello guys, I'm new to the disciples of Tzeentch, but I'm going to make a list because Tzeentch is my favorite chaos god, and I love the scheming and magicey aspect of it all. The thing is I recently got Archaon, because when I started playing warhammer fantasy over15 years ago I played chaos and archaon was my main man back then. So I want him to be part of my army. I usually play with some of my friends and we don't play the most competitive of lists most of the time but they're not bad either. So I was wondering if it's possible to have Archaon in a Tzeentch list that features around casting a lot of spells without the list being bad. But preferably without horrors as I prefer tzaangor or even the acolytes for battleline units Currently I got: Archaon Gaunt Summoner with familiars or a disk (got one from Ahriman) Curseling Changeling Tzaangor Shaman 3x Tzaangor Skyfires Demonprince (metal be'lakor) I was thinking of making something like this: Archaon (660) Gaunt Summoner of Tzeentch (180) The Blue Scribes (140) Curseling, Eye of Tzeentch (160) Lord of Change (380) 10 x Tzaangors (180) 20 x Kairic Acolytes (160) 10 x Kairic Acolytes (80) Umbral Spellportal (60) Anyways would love some insight in this as the armies I currently play aren't as hero/magic focused. Looking at the spoiler images and the fungoid shaman I think (and hope) some moonclan grot character will be riding a giant centipede like insect. Realm of Battle Rules: What are your experiences? I played a game with my stormcast vs my friend's nighthaunt. We used a random battleplan/realm and realmeffect. We got relocation-orb and chamon the realmeffect was the one where double casting rolls are always a succes and can't be unbind but cause mortal wounds to the caster and units around it. It was a pretty one-sided game because my lord could get within range of the orb on turn 1 and for the follow two turns the orb moved away from my opponent who's slow units couldn't catch it. At the end of turn 3 I had 12 points and couldn't lose anymore. However the realm rules where pretty fun, my evocator on a balewind vortex threw mortal wounds all over the place as she casted four double rolled casts in the battle.